My Grand Canyon Rafting Tour was better than I expected. 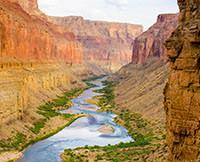 I just came off a Grand Canyon 7-day trip with Western River Expeditions. I made my reservation online and then had great support from a staff member, Sandy. The trip was really fun and the guides were very informative. The trip was better than I expected, and the food was great.